One of the highlights was an ESOP company panel of CEOs moderated by Joyce Klein, Director, FIELD economic opportunities program, The Aspen Institute and Ginny Vanderslice, Faculty Fellow and Mentor, Rutgers School of Management and Labor Relations; Principal and Senior Consultant, Praxis Consulting Group, Inc; Academic Director and Adjunct Faculty in Dynamics of Organization, University of Pennsylvania. Paul Decker of Mathematica Policy Research led off and shared their unique ESOP timeline. They were traded on the American Stock Exchange, bought by Martin Marrietta and employees bought back the company in 1986. Their ESOP started in 2005. BL Companies CEO, Carolyn Stanworth, also shared their story and answered some tough questions from the audience. They get the most out of their ESOP since the 2006 inception. 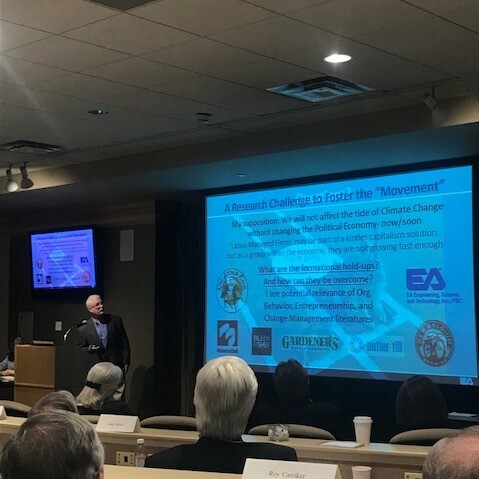 A personal highlight was the presentation by EA Engineering, Science, and Technology, Inc. PBC (EA) CEO, Ian MacFarlane. Ian got our attention right away by noting that we will not affect climate change unless we change the political economy. EA is people-cultured and mission-focused. They had a strong ownership culture even before their ESOP and the company has always been staff-driven. Founded in 1973 by a Johns Hopkins professor EA now has over 500 employees with 25 offices. EA went public in 1986 and I personally owned EACO in the 90s. They went private in 2001, did a partial ESOP in 2005 and went 100% ESOP in 2014 when they became a legal Benefit Corporation. EA has always been client committed and has been 100% committed to their employees since they went private. They have a bottom up sustainability history inspired by their millennial employees. Turnover is only 7% compared to 12% in their industry. EA doubled the Gallup employee engagement score after the ESOP was implemented. They get high scores from federal clients and their win rate improved over 20% after the ESOP. Their Treasurer, Peter Ney, probably has the most technical ESOP knowledge of any plan sponsor in the ESOP world. Ian and Peter are great examples of what servant leadership means. I have visited EA several times and they definitely practice what they preach. It was encouraging to see so many academics all over the world interested in employee ownership. I was inspired by having lunch at a small table with Dr. Virgil Wood. He was a personal friend of Martin Luther King Jr. and worked with him to improve Civil Rights in this country. I hope to read his latest book soon. Dr. Wood has said that Dr. King does not have a legacy now. Unfortunately, racism still exists, and Dr. King’s legacy should not be forgotten. He has some great ideas for the potential of developing a Fair Economy using employee ownership. I look forward to attending again next year.